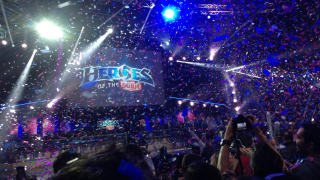 Blizzard has announced that registrations are now being taken for the 2016 edition of Heroes of the Dorm, the Heroes of the Storm competition that pits student gamers from across the US and Canada against one another in “the ultimate collegiate esports tournament.” More than $500,000 in tuition and prizes are up for grabs, and the action will once again be broadcast live on ESPN. Heroes of the Dorm registrations will be open until February 18, with online qualifiers beginning on February 20 and running until March 6. The first tournament stage, featuring the top 64 teams, will take place on March 19, followed by the “Round of 32” on March 20, the “Round of 16” on March 28, and the “Round of 8” on March 27, all of them broadcast live on Twitch, YouTube, and ESPN3. The Heroic Four will run on April 9, leading into the Grand Finals on April 10, both of which will be carried exclusively on ESPN2. ESPN coverage will also be available through the WatchESPN mobile app. Non-students will be able to get in on the action as well by predicting the outcomes of the tournament in the Heroes of the Dorm Bracket Challenge. Full bracket rules and prize details will be announced closer to the beginning of the Round of 64, but the most accurate bracket will claim a top prize of $10,000. Signup links for Blizzard's 2016 Heroes of the Dorm esports tournament and other details can be found at heroesofthedorm.com.